This image, taken by the NASA - MESSENGER Spacecraft on July, 4, 2014, features an highly elongated Unnamed Impact Crater (about 34,2 Km - such as approx. 21,238 miles - long and about 19,3 Km - such as approx. 11,985 miles - wide) which is located in the Southern Hemisphere of Mercury, and to the North of the very large (approx. 715 Km - such as about 444,015 miles - in diameter) Rembrandt Impact Basin. This Unnamed Elongated Impact Crater (that, in a way, looks more like a Volcanic Caldera...) was, most likely, formed as a consequence of a remarkably Oblique Impact Event (probably less than 15� from an - imaginary - perfect horizontal line), which created the Crater's distinct elongated shape and unusually-looking Central Peak. This Crater's Rays have faded over time due to the phenomenon known as "Space Weathering" (---> remember that the Planet Mercury, as well as many other airless - better yet: Atmosphere-less - Planetary Bodies are constantly being bombarded with Micrometeorites and Energetic Ions - like Solar Wind and Cosmic Rays - the latter coming from the most remote areas - as to our Solar System - of the Universe, such as from extremely far and distant Stars and Galaxies -, and this effect is known as Space Weathering), but when they were still visible, they should (most likely) have formed a butterfly-shaped pattern all around the Crater's Rim. 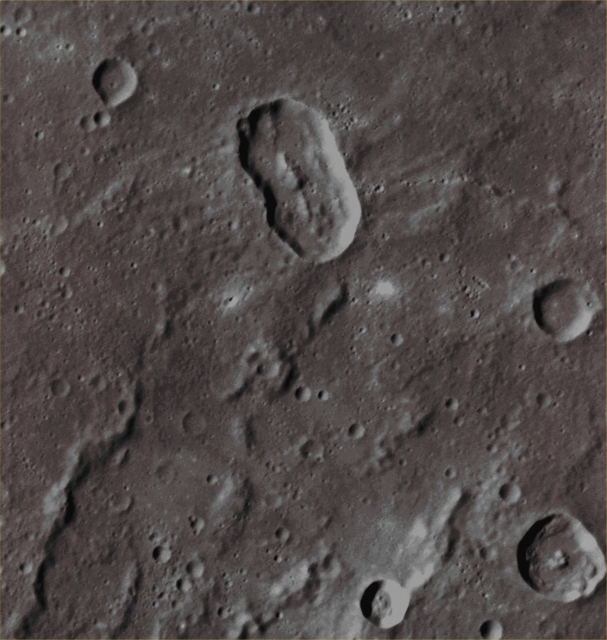 This picture (which is a crop taken from an Original NASA - MESSENGER Spacecraft's b/w and Map-Projected image published on the NASA - Planetary Photojournal with the ID n. PIA 18631) has been additionally processed, contrast enhanced, Gamma corrected, magnified to aid the visibility of the details and then colorized in Absolute Natural Colors (such as the colors that a human eye would actually perceive if someone were onboard the NASA - MESSENGER Spacecraft and then looked outside, towards the Surface of Mercury), by using an original technique created - and, in time, dramatically improved - by the Lunar Explorer Italia Team. Different colors, as well as different shades of the same color, mean, among other things, the existence of different Elements (Minerals) present on the Surface of Mercury, each having a different Albedo (---> Reflectivity) and Chemical Composition.